It’s official, I am a little bit addicted to slow cooking. As this blog clearly shows, I have a bit of a ‘thing’ for cooking almost everything slowly at the moment. Don’t get me wrong, I only slow cook if I think the recipe will benefit from it or it fits into my life a bit better… I’m not one to cook everything in there. So, when I first saw someone had cooked a cake in a slow cooker I will admit I was a little bit sceptical. I couldn’t really see how there would be any benefits to doing this and continued to cook my cakes in the oven. But when I saw the delicious cakes being made by Lucy over at BakingQueen74 in her slow cooker I just HAD to give it a go! I am sooo glad I did. I have discovered that cakes cooked in the slow cooker stay wonderfully moist and soft, just perfect for a recipe like this one. I’ve also been wanting to try out the Wright’s Baking cake mixes as I’ve heard they are delicious and so easy to make. I usually make all my cakes from scratch to my own recipe but I think it’s nice to have a few tasty high-quality mixes on standby for those last minute bakes. ‘Why not try one for my first attempt in a slow cooker?’ I thought. Again, I am so glad I had that thought as then this baby was born! 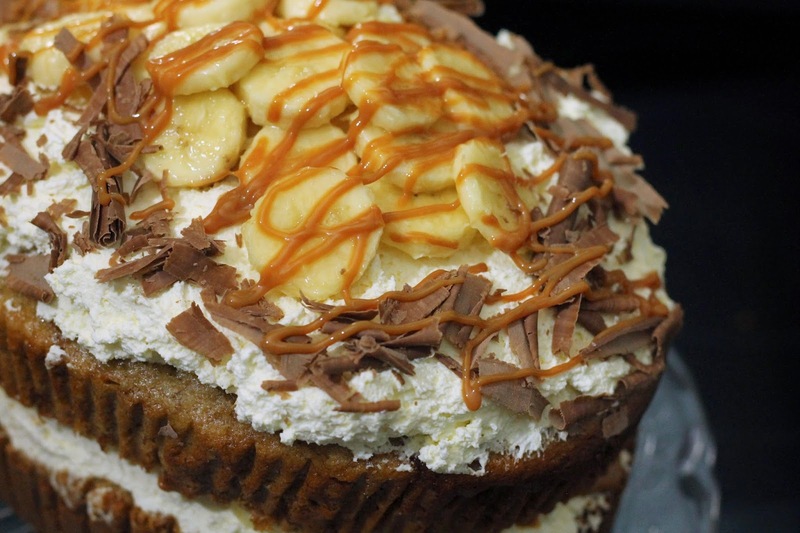 It is a lovely toffee and banana cake, sliced and filled with whipped cream, sliced bananas and a layer of dulce de leche. It is then topped with more of the same and some chocolate flakes too. I know it’s a little frowned upon to rave about your own food but for this cake I don’t care; IT IS DELICIOUS! Lucy has been very patient with me, answering all my questions and giving me tips on cooking cakes in the slow cooker and I am really grateful for all her help. Thanks, Lucy! It may look a little odd, but putting a tea towel under the lid of the slow cooker is an essential part of the process. It catches any condensation that forms inside the cooker and stops it from dripping back onto the cake; this would slow down the cooking and make the cake soggy. Yuk! Finally, I took a few pics of the ‘naked’ cooked cake as I wanted to show it would be beautiful just dusted with some icing sugar and served in wedges, if you like. That’s quite enough talking from me… Now, here’s the recipe I’ve been asked for around 1000 times so far! A moist and delicious banana and toffee cake, baked in a slow cooker. 1. Mash 2 of the bananas either by hand or in a mixer. Make the cake mix according to the pack instructions and add the bananas then bake for 1-2.5 hours until cooked (Check every half an hour from 1 hour and then every 15 mins when it is very nearly done. It is cooked when a skewer poked through the centre comes out clean.)2. Remove the slow cooker pot from the heating element and leave to cool for 10 mins then turn out the cake and leave to cool completely.3. Slice the remaining bananas and immediately put into a bowl with 400ml water and the citric acid or lemon juice; this stops them going brown when on the cake. Leave to soak whilst you prepare the other toppings. 4. Whip the cream until stiff and open the tin of Carnation Caramel. You are now ready to decorate!5. Remove the bananas from the acidulated water and pat dry. Split the cake and spread one side with a generous amount of whipped cream and the other with caramel. Lay slices of banana on top of the cream and sandwich the cake back together. Finish with another layer of cream on top, with the rest of the bananas and some chocolate shavings if desired. Store in the fridge until you are ready, then enjoy! I am entering this cake into the November Tea Time Treats Challenge hosted by The Hedgecombers with Lavender and Lovage. The theme this month is Bonfire Night and I think with all that toffee, this cake fits that theme! Thanks Mandy. It must be good for you to say that, your cakes are amazing! Very interesting way to make a cake! I like it.